In last month’s column, I briefly reviewed the major chakras (energy centers) in our bodies. This month, I will start a more in-depth discussion of each one, starting with the first Chakra. The First Chakra is also called the Root Chakra. It’s name in Sanskrit is Muladhara, which means Root. It is located at the base of the spine. Physically, it deals with elimination and the large intestines. 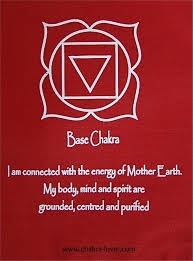 The color of this chakra is red, it’s element is Earth and it is considered a “masculine” chakra. The First Chakra is your foundation, literally, your roots, supporting you as a tree’s roots support it. The First Chakra is all about connection — your connection to Mother Earth, your connection to yourself and your connection to others and the physical world that surrounds you. This chakra is responsible for your survival, your need to feel safe and secure; having your basic physical needs met. When this chakra is balanced and functioning properly, you will feel as if you have a place in the world; you belong. You will feel at home and connected to those around you, able to trust them. You will feel secure and empty of irrational fears. You will be calm, able to relax, to be at peace with you and your body. Conversely, if you it is unbalanced, you will feel isolated and abandoned. You will feel unable to trust those around you; you will feel alone, insecure and fearful. A feeling of disconnection to everything and everyone around you will be present. As this is the first of the eight chakras, it is very important that it not be blocked, that it be open and balanced. Some of the exercises you can do to strengthen it, is to do what is called a Root Lock, which is just, simply, locking your root, squeezing the sphincter and releasing it several times. Any squatting exercise , as well as any that flex the spine, as a pelvic tilt, will also help. **Inhale through the nose, focusing your awareness at the base of your spine. Visualize a bright red light surrounding that area. Exhale in one breath, through the nose, feeling that radiant light filling your body. Inhale that energy; exhale, feeling alive, peaceful and calm. ** Do this for several minutes. Until next month, when we continue with the Second Chakra, I wish you peace, joy and happiness.